Capture, choose a filter, and then post! Millions of photos are uploaded to social media sites every day. Their easy-to-use platforms have paved a way for users to communicate with people from around the world. Their extensive reach creates opportunities for businesses to promote their products and services. There are a lot of sites to choose from, but if you are looking for a platform that lets you be creative with your craft, then Instagram is definitely the right choice. Instagram’s strength lies in its photo-centric and user-friendly interface. Businesses are using Instagram for their promotions because it lets them curate their posts in any way they want. 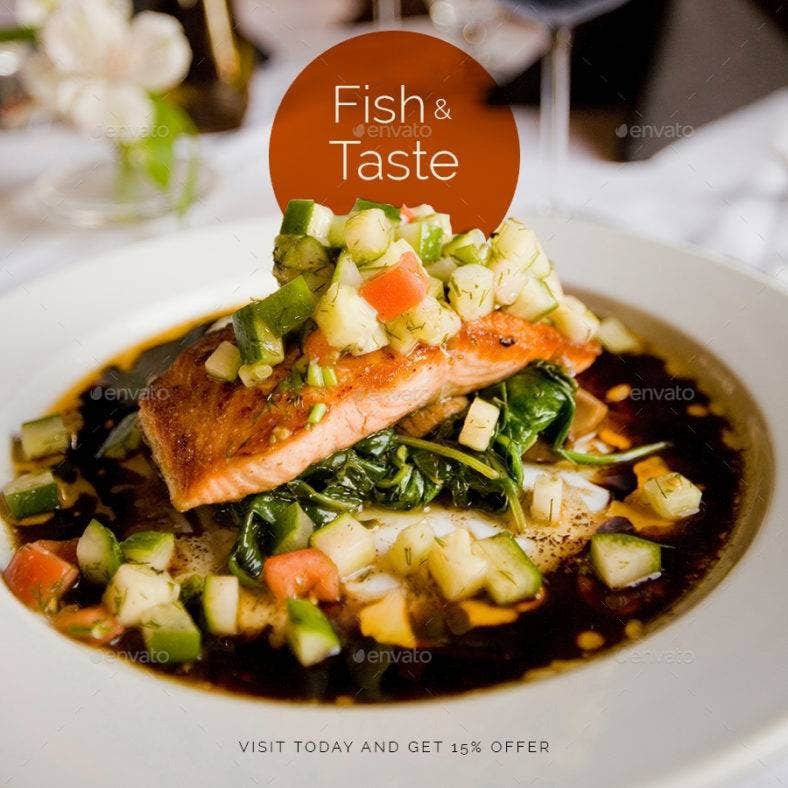 Restaurants, in particular, often create a food-centric feed for their accounts to attract customers. And in order to gain more following, artistic and captivating posts are needed. 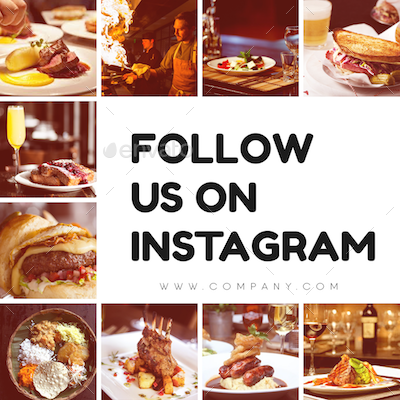 Listed below are the templates that restaurants can use to curate their posts on Instagram. Flat lay photography is a thing in social media. It is where you take an overhead shot of your subject, giving a bird’s-eye view of it. The white border creates a simple yet artistic emphasis on the food. The stylish overlaid quote is editable, so you can put your own slogan instead. If you have a website, you can edit the overlaid link and replace it with your site’s. With this template, a sophisticated look is achievable. The pink border gives off a sweet, bubbly feeling—a perfect fit for your cupcakes! The texts are editable and you can choose which font to use. The baker’s hat complements the theme, given that what you are promoting are baked goods. The overall pinkish layout is as cute as the cupcakes you make. Blurred backgrounds are used to shift the focus towards what is overlaid. But despite being just a background, it sometimes takes away the focus from the subject, most especially if it is food. After all, how can you resist not looking at its glory? 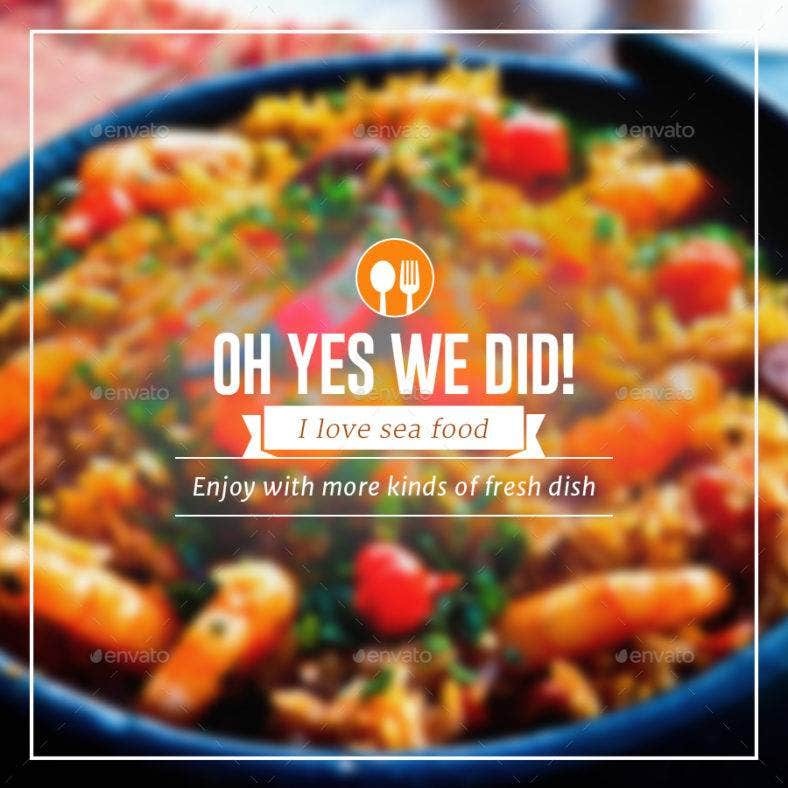 In this template, the blurred background may have placed the slogan in the spotlight. But you have to admit that you cannot stop yourself from staring at the background, right? If the style matches the theme that you are aiming for, then this template is for you. 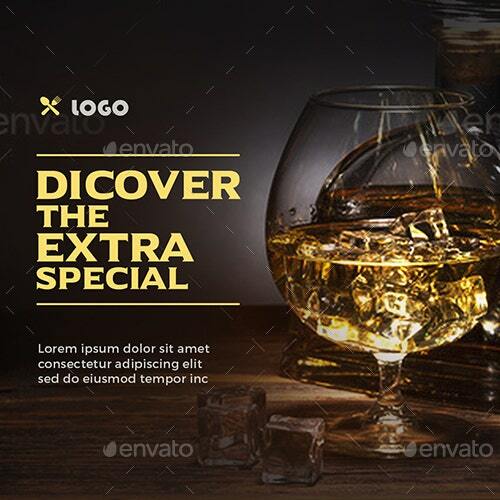 This template aims for a wooden theme with its border. If you look at it another way, it also aims for a native-looking style. It looks like the main dish for a breakfast menu. The overlaid green transparent cover resembles leafy vegetables that are usually served during breakfast. The texts are editable and you can choose which fonts to use. Check them out and see if the style fits your liking. People can smell discounts even if these are miles away. 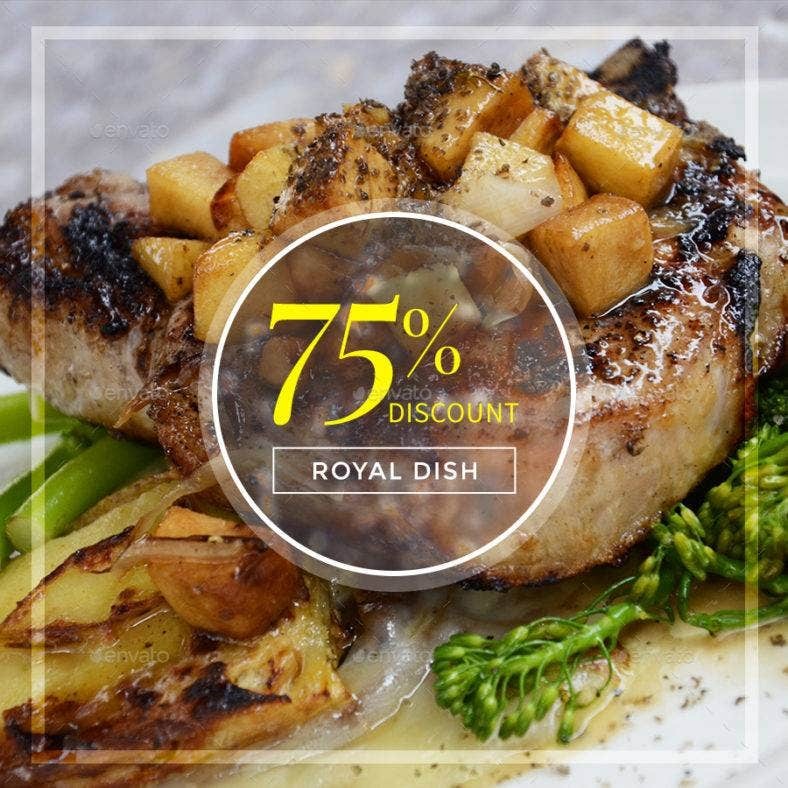 The slightly transparent circle encapsulating the discount percentage highlights the purpose of the photo—which is to inform customers of the restaurant’s food discounts. The transparency of the circle does not block the background so people can still see the whole image of the featured photo. If you want people to directly get the message you are trying to convey, this simple layout is the perfect fit. Just remember to prepare discount vouchers, in case people will come flocking to your restaurant once they see this post. A special dish deserves a special design. The maroon background embellished with floral patterns makes it look like a classy and elegant ad. The vignette adds a dramatic flair and emphasis to the dish as if it is put into a spotlight with a surrounding audience waiting to taste it. The unique border, which resembles a brush stroke, perfectly blends with the background, further highlighting the dish. 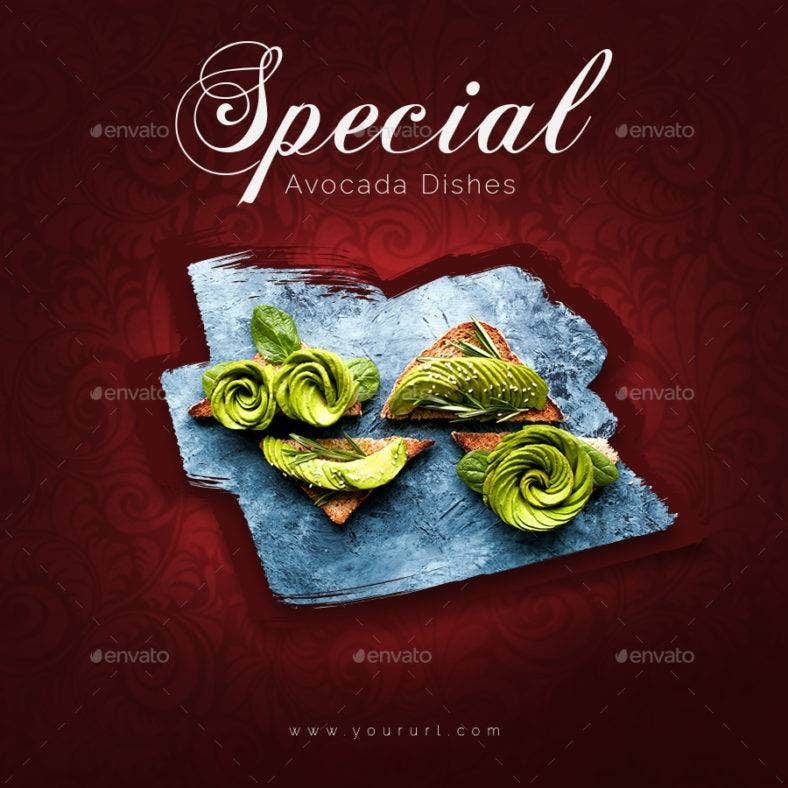 This template will surely let your customers feel that your dish is special as well as delicious. Grilling can get messy, but it does not always have to look ugly. So let us doll it up a bit, shall we? The vignette adds a serious tone to the dish as if telling people that grilling is something not to be taken lightly. The font style may look like nothing fancy, but it complements the style of the template. 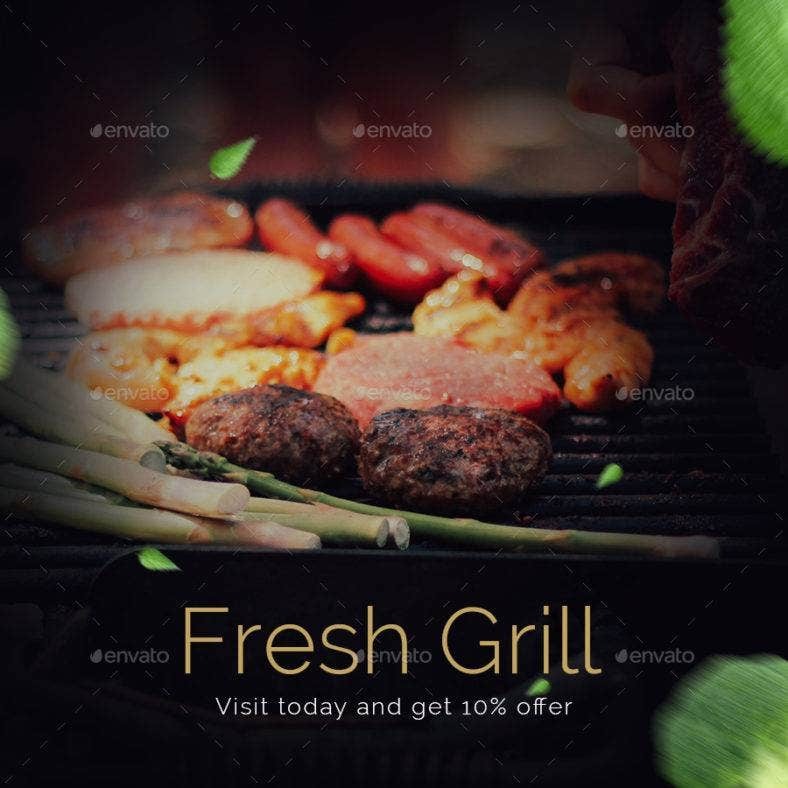 If you want your grilled dishes to be featured this way, then give this template a try. This layout is as minimalist as it can be. 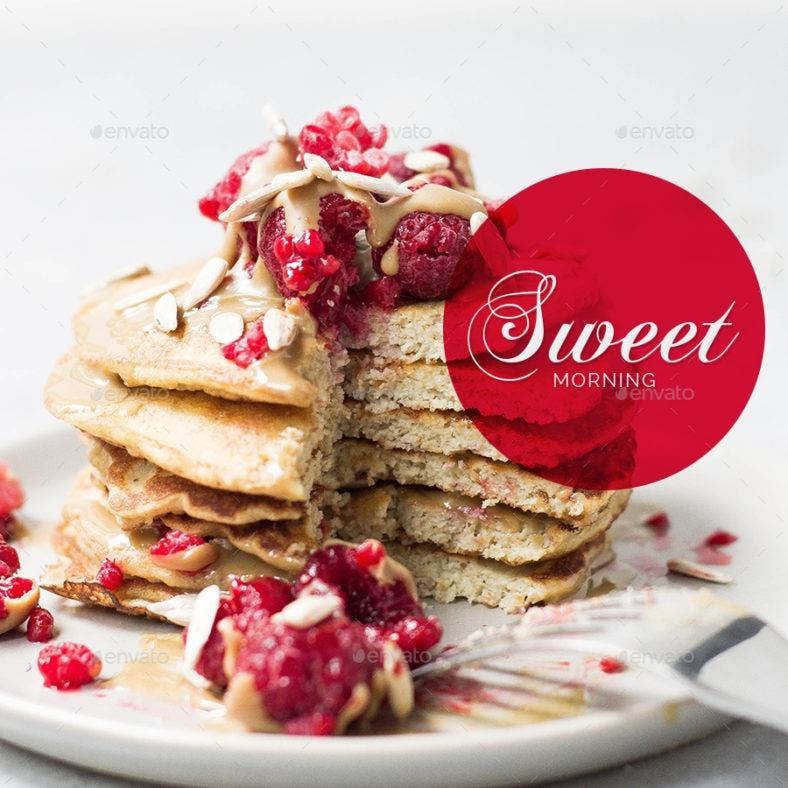 The only design is the slightly transparent red circle that resembles the color of maple syrup or strawberries. The rest of this template’s beauty lies within the background photo. So stack those pancakes up and cover them with glistening syrup! This template’s layout will work well if the background photo and the design complement each other. 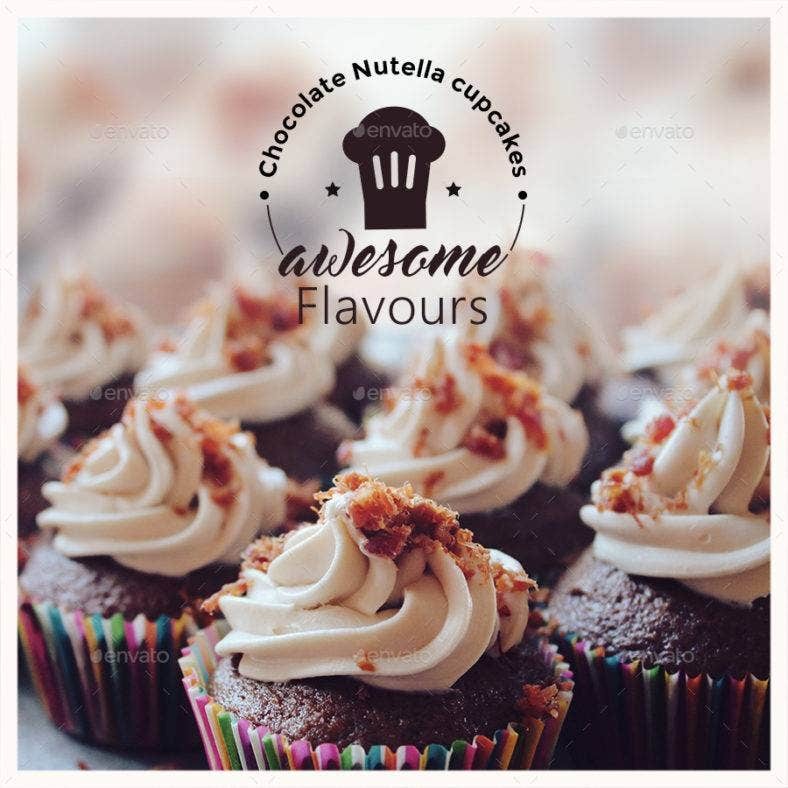 Give this one a try and challenge yourself to create an awesome post! This is another template for a flat lay, but with an artsy touch. Well, artsy in a way that the materials used in the photo are meticulously laid out. Carefully place your materials in position so you could fully use the design of this template. 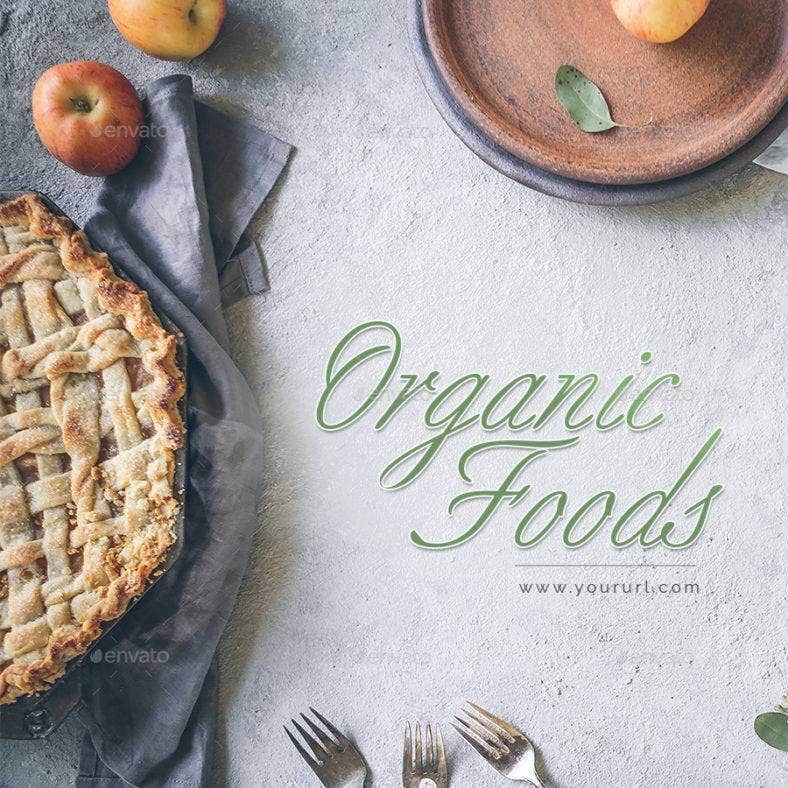 This template can pass as a cover for an organic food brochure in your restaurant. 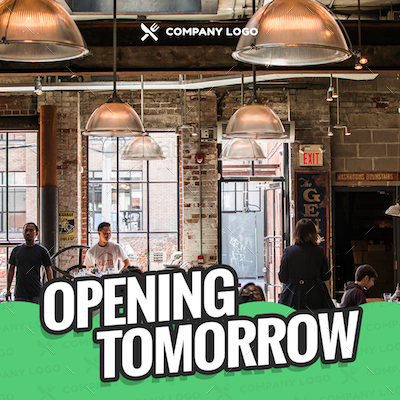 Space is reserved for the slogan or the company name, so remember to include this detail in your picture. 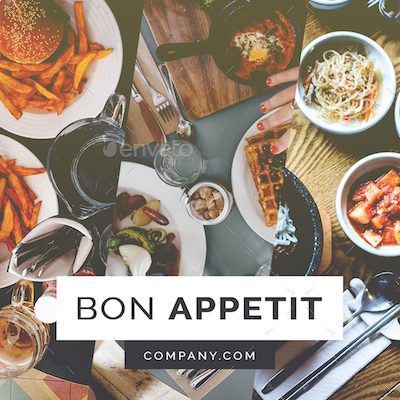 This type of layout is popular in social media, so make one for your feed! This is another minimalist design that puts your dish on the center stage. The only design is the circle that seems to be placed at the back of the dish. The photo of the dish is taken at a close range, blurring everything else other than the dish itself. This template does not have many decorative pieces, but it gets the job done. Wines are classy, and so is this template. The typical vignette sets the mood of being in a wine bar—expensive, exclusive, and intimate. The color used for the text is quite similar to gold as if hinting that the wines served by the restaurant are high-priced. Or, it could also be just to add style to the template. There is enough space to put your company name, slogan, and other necessary details. There is no food in the world that suits flat lay more than pizza. Flat lay exposes your pizza’s toppings. Customers would drool over them once they take a glance at the pictures. The design makes the template look more of an ad. There is a dedicated place for your logo and slogan. 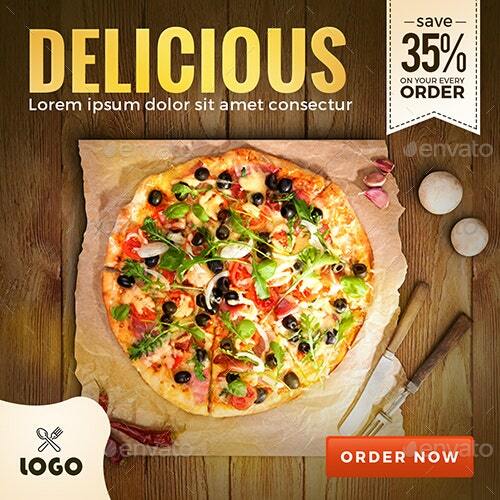 You can also put a figure if your pizza is has a discounted price. Use this template now to gain more followers on your account. Opening a restaurant is a success itself, but it would be more successful if you could gain a lot of customers during the opening. The template lets you feature your restaurant, whether it is the facade or the interior, or anything that you prefer. The opening is a critical point, so attracting customers is of utmost importance. Followers are essential for businesses promoting their products or services on social media. The more followers you have, the wider in your reach. The grid layout lets you feature any aspect of your restaurant—food, dining area, wall decorations, etc. The photos all have the same Instagram filter. 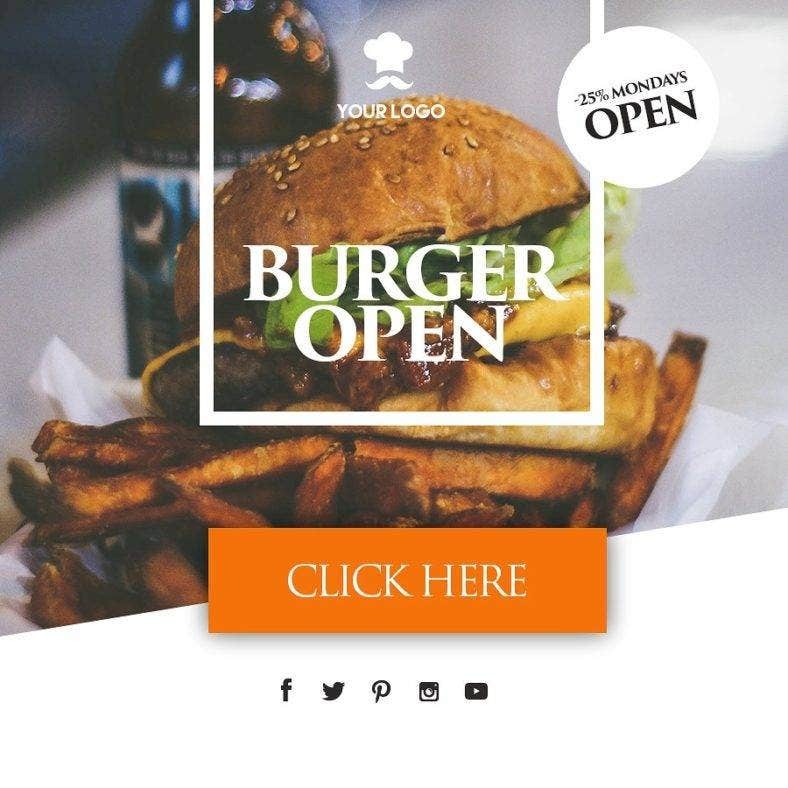 It is a perfect template for you to showcase what your restaurant can offer. The black and white color scheme of the design brings a modern feel to the feed. The photos are all in flat lay and they commonly use the X2 filter on Instagram. The background is divided diagonally into three parts, which is enough to feature the best aspects of your restaurant. Let out your inner modernist and add this template to your feed. Burgers are a staple when it comes to fast food restaurants. Show off your burger in all its glory. If you want, you can accompany it with fries and drinks for the options of the additional food that people can buy together with the burger. The text is editable, so you can put your slogan or anything that you prefer. Get this template and let the world know that your burgers are the best of the best! Squares are becoming a thing in the realm of Instagram. 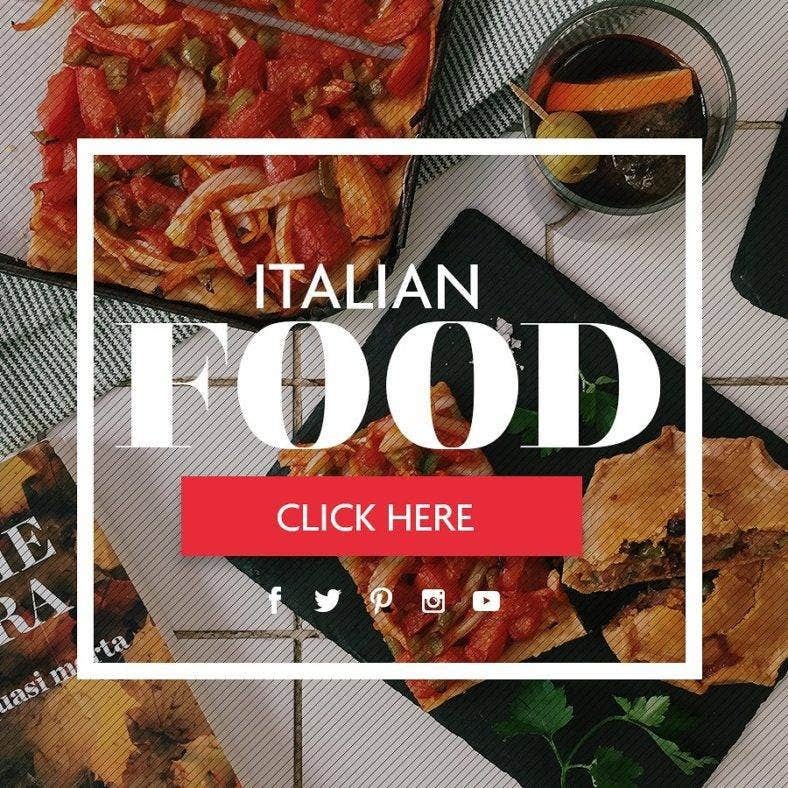 Italy is known for pizza and pasta, but with this template, you can show more of what Italian cuisine is about. It is a clean and simple layout so the focus is more on your food. The design looks like it came straight out of a magazine. 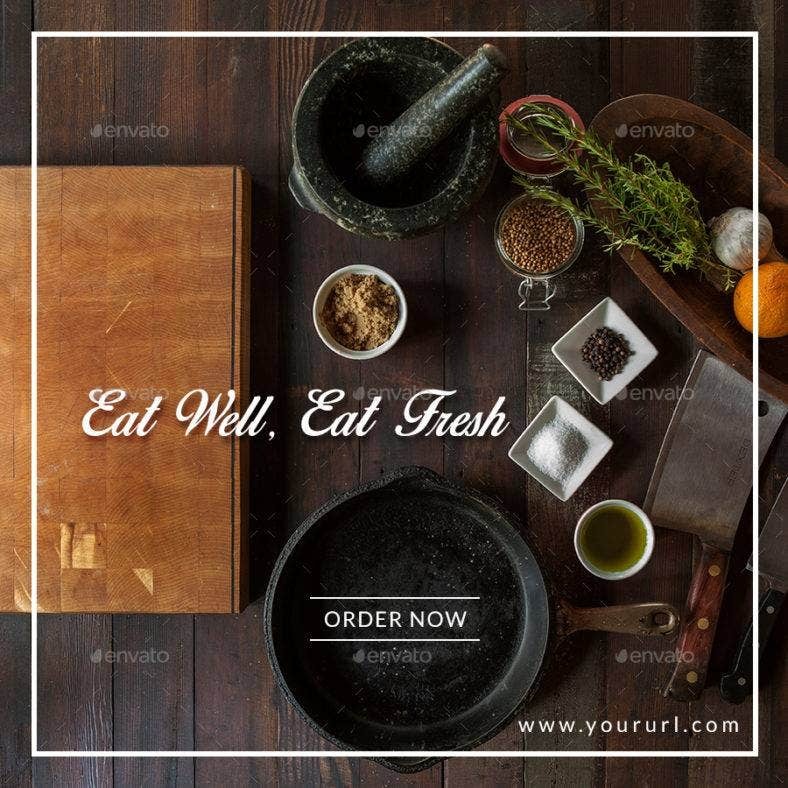 Your Italian cuisine will surely be flaunted well with this template. Give it a try! Viva Mexico! Mexican restaurants are known to have festive decorations lining up their walls. Why not do it with your Instagram posts, too? The colors and icons used in the design evoke up a festive mood. 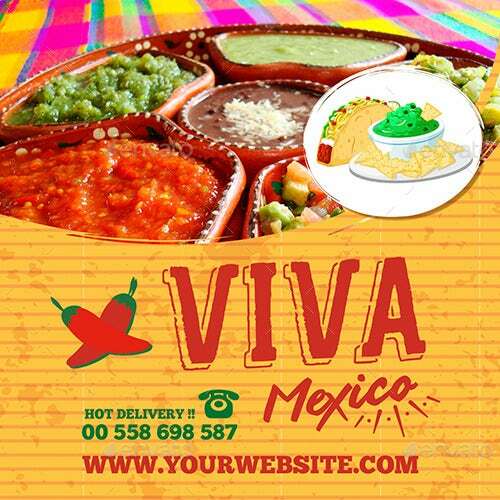 The tacos and nachos accompanying your featured image let everyone know that you are serving Mexican food and nothing else. You can put your contact details so people could ask for more information about your restaurant. 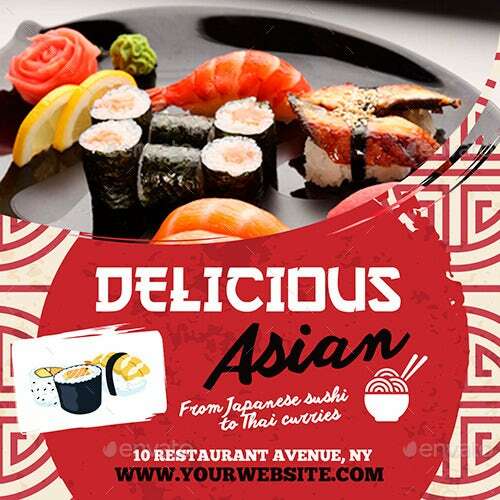 You can immediately tell that the restaurant is serving Asian dishes if it has sushi in it. The colors, font styles, and background patterns are reflective of Asian, specifically the country of Japan. The red circle in the center resembles the prominent shape in the center of Japan’s national flag. Use this template and people will immediately know that this post is about an Asian restaurant. Health is wealth. And with this template, wealth will definitely come your way. The color scheme gives off an earthy feel, reminding us of the vegetables that we eat. 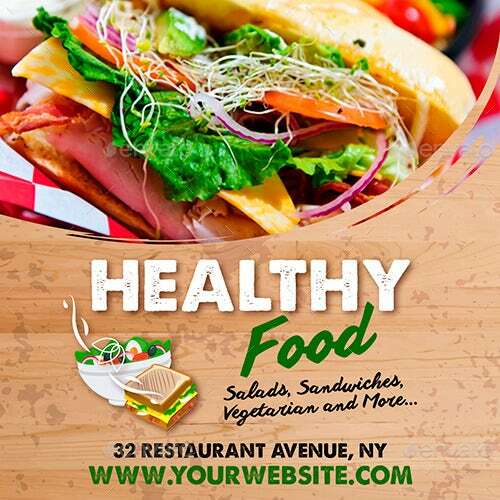 The icons feature salads and sandwiches that are commonly served as healthy dish options. Vegetarians will definitely crowd into your restaurant once they see this template! 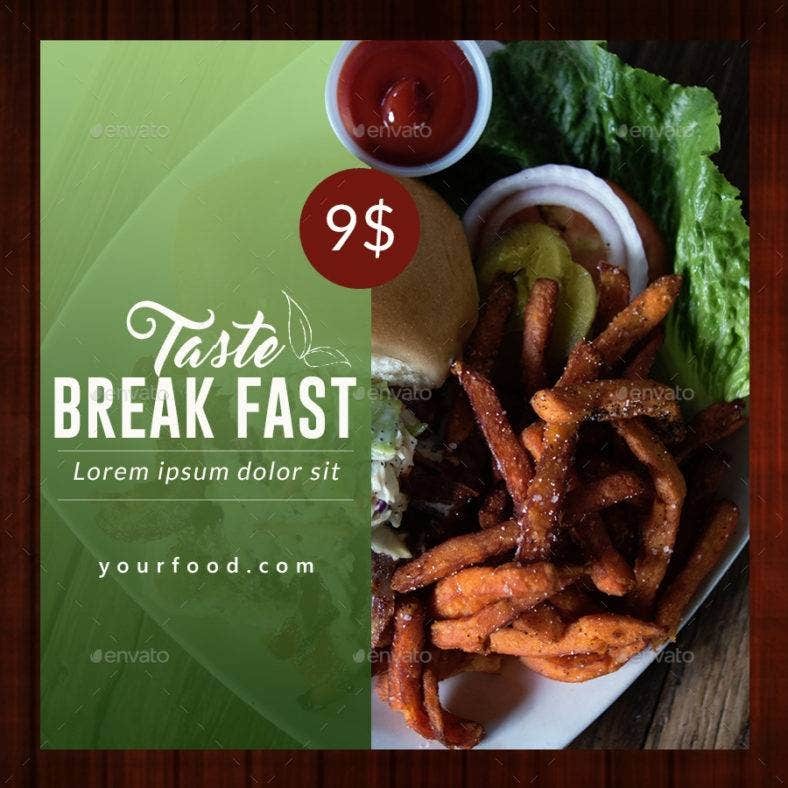 The variety of designs that these templates offer give you the option to choose which of them will fit the theme that your restaurant is going for. Explore all of these templates. Experiment and challenge yourself into curating the Instagram feed for your restaurant and reap greater success at attracting followers and customers!